Roosevelt Plaza Park is located in front of City Hall. The purpose of the park is to enliven Roosevelt Plaza through low cost and flexible placemaking strategies that will guide future park improvements in the coming years. A major feature of the installation is an interactive light sculpture utilizing IBC totes as building blocks. The totes are reconditioned storage containers that are refurbished by several Camden businesses. The design team will be observing Roosevelt Plaza Park throughout the year to see what elements of the park work best, and which could be improved. TO LEARN MORE ABOUT RPP, CLICK HERE TO READ OUR FINDINGS SUMMARY REPORT: Roosevelt Plaza Park Pop-up Report. Last year’s award winning project at Roosevelt Plaza Park, located in front of City Hall, featured an interactive light sculpture utilizing local IBC totes as building blocks. This year’s installation re-purposes these IBC totes into a green infrastructure. With large collection saucers on top of each tower, rainwater will be collected, transported, and harvested in an artful and educational manner. Rainwater will flow from each interconnected tower through a large, blue aerial pipe to a reservoir that will be used to irrigate the planted towers themselves, and an overflow of the system will be directed into a planter designed as a demonstration rain garden. A “rain curtain” fountain and interactive “water organ” was integrated into the installation. A grove of wispy willow trees and umbrellas provides opportunities for shaded seating. The intent is to create a pleasant, tranquil place for park users to enjoy. Roosevelt Plaza Park is located in front of City Hall in downtown Camden. The once underutilized space has attracted many of the city’s residents, students, and workers due to the successful iterations that sought to enliven the park for the past three years. This summer's installation incorporates a focus on health and wellness highlighting the Horizon Healthy Camden series, which is funded by the Horizon Foundation of New Jersey and supported by the City of Camden and Cooper’s Ferry Partnership. The series aims to create a healthier environment by providing Camden’s families with opportunities for safe and sustainable outdoor living. “The Healthy Pop-up” gives residents an opportunity to get active by using their own physical power while observing the power of water and wind. 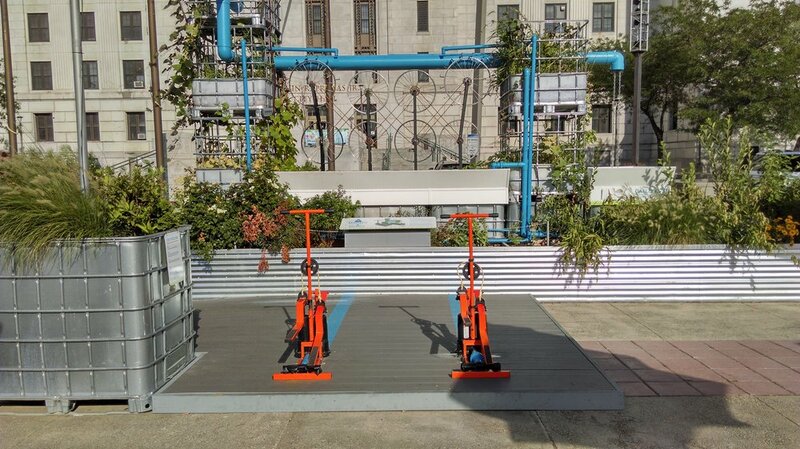 Visitors can use orange-colored treadle pumps, that work like a stair-climber machine, to pump water and turn the bicycle wheel sculpture mounted in the rain curtain fountain from the 2015 installation. The healthy pop-up adds plantings that Camden residents can grow in kitchen gardens at home, including sunflowers, climbing gourds, a variety of culinary herbs, and several plants to attract pollinator species such as Cosmos and Echinacea. Additionally, park visitors can observe the power of wind spinning the various windmills in the park built from reused bicycle parts. These sculptural elements add to the tranquility of the park space which has attracted so many users over the past three iterations.